For 90 plus minutes tomorrow, Blackpool will be our opposition and I won’t be wishing anything good for the team or its supporters. But at other times I have a great deal of sympathy for Blackpool supporters and players; they have had problems with owners too. So I like the idea of Birmingham and Blackpool players posing for a mixed squad photo before the game. 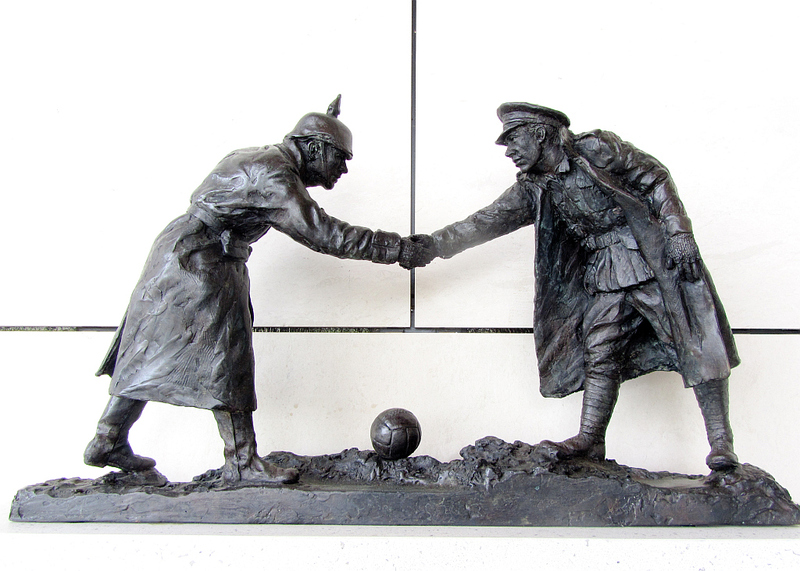 This is in honour of Football Remembers Week, commemorating the 1914 Christmas Truce between British and German soldiers. From time to time it’s good to be reminded that football can bring people together as well as cause arguments. The truce will also be commemorated in a series of Silent Night Carol Services, including Carols in the Stadium at St Andrew’s on Sunday. I’ve been busy these last few days and haven’t had much time to spend at my computer. But when I do go online, I feel as though I’ve stepped into a parallel universe, with power struggles, a purported bid to buy the club and Zigic returning. It’s all too much to take in. Some carol singing sounds like an excellent way to step back from the craziness of Blues’ news and calm down a bit. This entry was posted in Birmingham City FC, Football and tagged Birmingham City F.C., Blackpool FC, Christmas truce, Football, World War 1 on December 5, 2014 by Puddleglum. I’m actually one of the organisers of this event, and also a life long blue nose! Thank you so much for your thoughts on the event, the tickets are free and we are hoping this event will serve what is already an incredible community of people. Gary will be present and speaking for part of the event, so even if just to support our manager, we’d love to see you there.